Up to 60% Off Menswear in the Clearance at Next - Includes Suits From smart suits to casual loungewear, find everything you need at half the cost in the Next Clearance. Women's Party Clothing and Outfits from £18 at Next Turn heads for barely any cost thanks to the varied and competitively-priced selection of party wear from Next. Discover £400 Off Furniture in the Clearance Sale at Next - Includes Sofas and Storage Bring a fresh new look to any home with a few key pieces from Next! Find chairs and furniture with savings of over £600 in the clearance. Unlimited Next Day Delivery for £20 Per Year at Next Always shopping online with Next? Get unlimited next day delivery all year for just £20! Up to 50% Off Women's Footwear in the Sale at Next Step out in style this Spring with up to 50% off women's footwear at Next! New Arrivals Homeware from £2 at Next Give your home a revamp this year with some perfect home decor pieces from only £2 at Next. Women's Spring 2019 Arrivals from £3 at Next Feel stylish whatever the weather with new 2019 fashion and accessories starting from just £3. Up to 50% Off Girls Dresses at Next They'll love the party dresses at Next, now with up to 50% off! Gift Cards from £10 at Next Choose the amount and style of card and give the gift of choice to your loved ones this year. New Spring Collection from £3 at Next Shop the brand new Spring styles, from £3 at Next! Up to 50% Off Homewear in the Clearance at Next Shop the gorgeous collection of homeware now available with up to 50% off! Next offer their customers contemporary, timeless style like no other fashion retailer. Able to please men, women and fashionable kids - not to mention homeowners looking to reflect their style within their living space, Next are the fashionable high street staple ready to with a frock, a suit or accessories to fit the occasion at hand. Next clothing is designed with both the little details and big statements in mind - whilst always staying effortlessly chic! Women trust each season’s new lines, men flock to the tailored suit rails and children happily prance and play wearing Next clothing day and night. Get a little more fashion for your money the next time you shop in-store or online, with the latest savings from vouchercloud. Our range of offers will curb your spending without asking you to sacrifice your sense of style - so you can pick up some fresh outfits ahead of the new season guilt-free! How do I use my Next discount code? Login or select New Customer if this applies to you. Click ‘Continue’, see you discount applied and complete the checkout! "When you’re browsing for underwear, plain t-shirts, socks and leggings, keep an eye out for multi-buy offers that give discounts when you buy more, and stock up on simple and versatile basics for much less." Where is the nearest Next? The online Store Locator will help you find your nearest Next, and give you information on opening hours and directions to help you get there. How much is Next Delivery? Next know that one delivery method doesn’t suit all, so they’ve got a choice of delivery options for your convenience. Next Day Delivery to your local store is free, while Next Day delivery by courier to your home is £3.99. For full details of all delivery options available to you, visit the next store here. How many Next Stores are there? There are 37 Next stores in all the main cities in the UK, some of which are retail stores and others clearance stores. There’s bound to be a Next near you, but you can find all their new ranges online if you’d rather shop from the comfort of your own sofa. Although you'll probably love every order you receive from Next.co.uk, if you're ever not 100% happy you have 14 days after receiving your items to send them back for a refund or exchange. 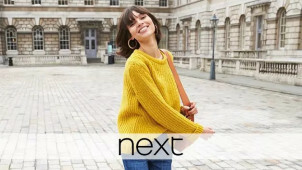 Next offers high quality, stylish clothing and homeware that fit your lifestyle perfectly- a simple philosophy that results in gorgeous and ever-changing fashion collections for men, women and children. You shouldn’t have to wait to get the style you deserve, which is why we’ve always got a Next discount code to make sure your dream look isn’t beyond your budget. High-end fashion doesn’t always have to come with a high-end price tag! The first Next store opened in 1982 with a womenswear collection, but the demand from stylish men saw them launch Next for Men only two years later in 1984! Now they have collections of childrenswear and homeware to refresh each season too, so the whole family can feel-good in new fashion. Spread the word, check out the catalogue and it won't be long until you Next refer a friend to this stylish store again! The new in Next dresses for women and girls are sure to have you swooning. From occasion dresses in light linen and bright patterns to bold evening statement dresses and more, there's a lot to discover here. Next voucher codes will let you save on beautiful dresses from the Next own brand and from other brands too such as Lipsy, Boohoo and Pretty Little Thing. For wedding guest attire, for a weekend trip away or even a business meeting, women of all styles, shapes and sizes can find the perfect dress from Next.